YANGON — Getting paid to dress models and celebrities in the latest styles sounds like fun, right? But just exactly how does one go about getting into this line of work? The fashion industry in Myanmar is still a small community, and there aren’t that many really top-quality, hardworking fashion stylists. I caught up with Yoko San, who has established a reputation as a top local fashion stylist over the past decade, and asked him what stylists do and whether he had any tips on how to get into this line of work. Yoko San (also known as Aung Sithu) is hard to miss. The tall, pale 29-year-old is always decked out in the latest fashions. Since making a start in the fashion industry at age 19, he has worked with some of the biggest celebrities and models in Myanmar and done many fashion shoots, commercials, TV series and movies, along with countless fashion shows. “When I was 18, 19 years old, I was still a student and Yangon only had a few local fashion magazines, but I’d wait for them to appear at the end of each month and read them all. Then, one of my cousins started working for a local magazine called People and that allowed me to establish some work connections,” Yoko San said. He joined the magazine but initially he was unhappy, as he was assigned to work in the sport section’s marketing department. He never lost interest in his hobby, fashion, and would set up his own photo shoots in his free time. His big break came when he got an offer to do a photo shoot for Mandalay Icon magazine. The publisher noticed his talent and offered him a job. “I was shocked, happy and excited all at the same time when I heard the news. It was a risk for both sides: The idea of a ‘fashion stylist’ was still an unfamiliar concept to the local magazine industry at the time,” Yoko San said. But in the end the move worked out for both. Yoko San ended up working for the magazine as a stylist for two years. “Those times were unforgettable and I learned many things. At first, my coworkers had many questions. They wanted to know what I was doing there, and what a stylist does, and so on. I put up with the gossip and the challenges because I loved my job. I did my best and I and the magazine built our reputations together,” Yoko San said. Yoko San said that when styling famous models and celebrities, he is faced with many different characters and patience is required. His was given his professional name by his mom, and most people only know him as Yoko San. “My mom’s favorite singer is John Lennon from The Beatles. His wife’s name is Yoko Ono. When [my mom] was pregnant with me, she decided to give me the name ‘Yoko San’, even if her baby turned out to be a son. And she really did it!” Yoko San said. However, his grandfather insisted he have a Burmese name as well, so he was also named Aung Sithu. After working for two years as a fashion stylist, Yoko San needed a new challenge and wanted to do something more creative, so he joined a new fashion magazine, MODA. “As you know, MODA is now a famous local fashion magazine, but at that time it was still new. I like new challenges and I wanted people to see the new things I was doing,” he said. Two years later, the stylist had to make another difficult decision. It wasn’t easy but looking back on it he believes it made him the person he is today. “Readers noticed me and the magazine; I was achieving my goals but the situation was changing at the company and I was getting bored with the magazine job. So I decided to work as a freelancer,” Yoko San said. The first three months were really hard and full of stress because prior to this he has been working with the support of a team, he said. While struggling to make a living, he still needed to catch up with all the latest fashions, and keep up with the latest trends in the business, and he tried never to miss a fashion show. 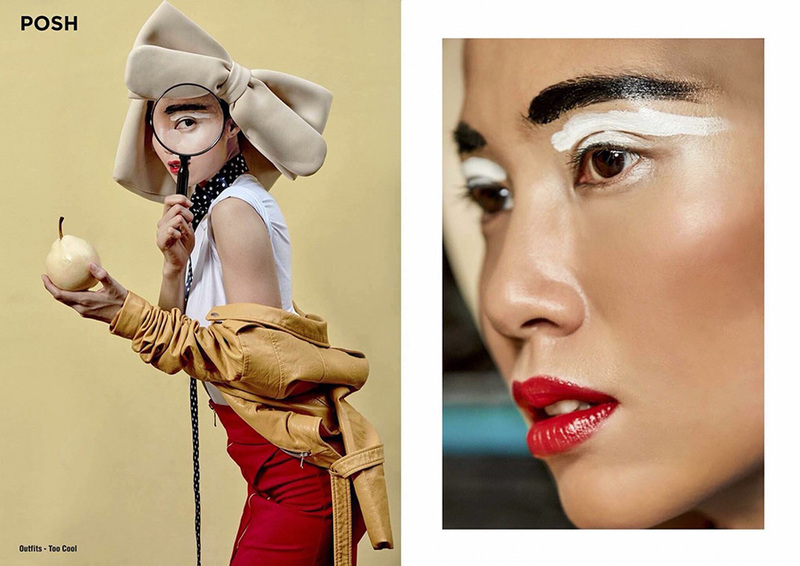 “I had to learn on my own by studying famous people and their individual looks, to see what fashion worked for M Seng Lu [a local supermodel], or what won’t work with [Myanmar Academy Award-winning actress] Eaindra Kyaw Zin,” Yoko San said. Though he has faced many struggles and hard times, Yoko San has never thought of giving up his job—though he would like to get a few more hours of rest in. “I love my job and I love what I do. So I won’t give up and I will keep learning and trying as best I can. Sometimes, when I’ve got a full schedule, I wish I could have a normal office staff because they have public holidays off, annual leave and normal working hours, but those thoughts only last a minute or two,” he said. The fashion industry in Myanmar is still developing and there are few resources for aspiring stylists. Furthermore, there is a lack of educational opportunities for them. Stylists need to study and update their knowledge on their own. Yoko San hopes to see more opportunities develop for people in the fashion industry through fashion workshops and such things. The concept of a “stylist” is becoming more familiar in Myanmar, and that’s a positive development for the industry, Yoko San said. “I always welcome newcomers. It’s positive for the industry, but one problem is that many people confuse the words ‘stylist’ and ‘stylish’ in their working profiles. Please study the difference between these two words, and don’t chase success only for the sake of being popular,” Yoko San said.